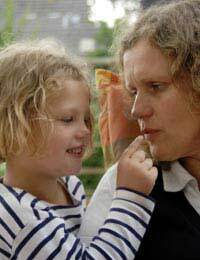 Auditory Verbal Therapy is a method of communicating with young children who are hearing impaired from birth which has come to the UK from the USA, where it is exceedingly popular. It is beginning to gain in popularity in the UK though as it allows parents to teach their children to talk, even if they are hearing impaired. It works on the premise that very few children who are born with a hearing impairment can hear absolutely nothing, and thus, with hearing aids, a child's hearing can be boosted to the level which allows auditory verbal therapy to be used. Listening is key to the auditory verbal therapy approach. Children with some residual hearing have to be taught how to listen and this is primarily the role of the auditory verbal therapist. The support and involvement of the family is vital, as the child will need plenty of encouragement and support as they learn to listen and in turn speak, as these basic skills which come easily to the rest of us are a real battle for deaf children. Children tend to respond to pictures and visual cues so the first stage of auditory verbal therapy is making sure the child listens to sounds and responds to these rather than visual cues. For example, a child can be taught to listen for the sound of cutlery on plates and associate this with feeding time, rather than watching for a bottle. The next steps in the process involve the child trying to reproduce the noises they hear and associate with certain objects. This is where traditional baby speak comes in, with the child being encouraged to make the noise they associate with a car or a cow or a dog instead of trying to teach them the name. This is because their residual hearing may not allow they to distinguish the word dog, but it will allow them to pick up a loud bark. Although auditory verbal therapy needs a therapist qualified to teach the child what to listen for, the parents and the rest of the family are absolutely vital when it comes to developing the child's speech. Typically, the child and family will see a therapist for a couple of hours a week and then will go home and work on all of the techniques all day every day. The therapy has to be fitted into everyday life as it is the only way in which the child will absorb enough to be able to learn to communicate themselves. Parents who have discovered auditory verbal therapy are often quoted as saying how it has transformed their family's lives. It gives a voice to children who others may have assumed would never have a voice and it gives the child a greater sense of value and their own worth because of that. It is hard work and by no means easy, but to give a child the opportunity to speak, however they do it, cannot really be seen as anything less than worth any effort.